Show season is right around the corner and we wanted to share some simple tips to help you maximize your experience and hopefully assist you with bringing home a few ribbons. We’ve found basic preparation is critical to getting your birds to look their best. It is important to thoroughly bath your chicken a few days before the show to remove the dirt that is nestled deep in the feathers. Use a pan of warm water and a good poultry shampoo, such as our Blue Ribbon Show Shampoo or our Blue Ribbon Rx Remedy, to assist with cleansing. Washing your poultry several times with shampoo and rinsing will ensure that the beneficial natural oils are stored. We do not recommend that you use dish soap as it can be too harsh. Be sure to clean your bird’s legs during this process as it is easier to remove the dirt after it has been loosened up. A toothbrush and toothpick work great for getting into the grooves and removing the last of the dirt. Finish this process with wrapping your bird in a towel to absorb the excess water built up on the feathers after bathing. Remember that your bird is not able to regulate their body temperature when their feathers are wet, so they will be chilled after their bath. Towel drying your bird will assist with keeping them warm. To create nice, fluffy feathers, use a blow dryer on a warm setting to finish drying your clean bird. Some birds really enjoy this process while others do not. If your bird does not enjoy this step, you may want to skip. Use caution when blow-trying — make sure the temperature isn’t too hot, and do not hold the dryer too close to your bird to avoid burning them. After grooming, while you are waiting to be judged, place your bird in a clean cage with fresh bedding and to let them finish drying. Be sure if it is hot outside that you provide them with plenty of water and shade to stay cool. Grooming your prized possession is important so they score high when being judged. Remember, the key is to enhance their natural features and beauty. First, take a look at their face and use a damp Q-tip to remove any dirt above the eyes, on the comb and feet that still remains after bathing. If your bird’s top beak hangs over the bottom beak (overbite), you will want to clip the top beak. Use a pair of animal clippers and take small nips off the beak to even them up. Follow the natural curve of the beak and use a nail file will provide a nice smooth edge. Next, clip their nails. Using a football hold will allow you to work on each leg easier. If they have sharp nails, use a nail file to create a smooth edge. Be careful not to clip too close as they will bleed. Applying pressure will help stop the bleeding. Your bird’s nails should have a nice, rounded shape when done as this is their natural shape. Before showing, use a good lotion or Vaseline and massage into your bird’s comb and wattle and on their legs to create a healthier, shine and a more attractive appearance. Wondering which breeds make for good show birds? One of our favorites is the Black Giant. This is the original Jersey Giant developed in New Jersey in the late 19th century by crossing several of the large, dark Asiatic breeds. Its black plumage has a beautiful green sheen, the eyes are dark brown, shanks and toes are black except for yellow skin showing on the bottoms of the feet. With the straight red comb and tremendous size, it makes an unusually handsome variety for exhibition. Cochin – Cochin varieties date back to the 1870s. These large, stately birds are known for their fluffy feathers from tip to toe. Buff Cochins are covered with an abundance of soft, fluffy golden feathers and create a sensation when shown. White Cochins have a quiet disposition and are outstanding for exhibition. Dominique – This breed is distinctly American, dating back to the early days in New England. They have rose combs, medium sized bodies, prominent tails, and black and white barred plumage. Buff Orpington – Introduced from England in the late 1800’s, Buff Orpingtons have become one of the most popular farm fowls in this country. These large, stately birds have a quiet disposition. These “Golden Beauties” have been one of our most popular varieties for years and years with their glistening plumage. Bantams —The flower garden of the poultry world, these miniature chickens are usually one-fourth to one-fifth the size of standard varieties. B.B. Red Old English Games are very popular because of their alertness, upright appearance, and confident personality. The males in all of these varieties are very striking with bright colored plumage and a certain “cockiness” to their identity. The comb on games should be dubbed (cut) for show. Black Tailed White Japanese Bantams‘ history can be traced back to Japanese paintings over 300 years old. These bantams carry their tails upward and higher than the head, the wings angle down and back along the sides and they are nice for show. 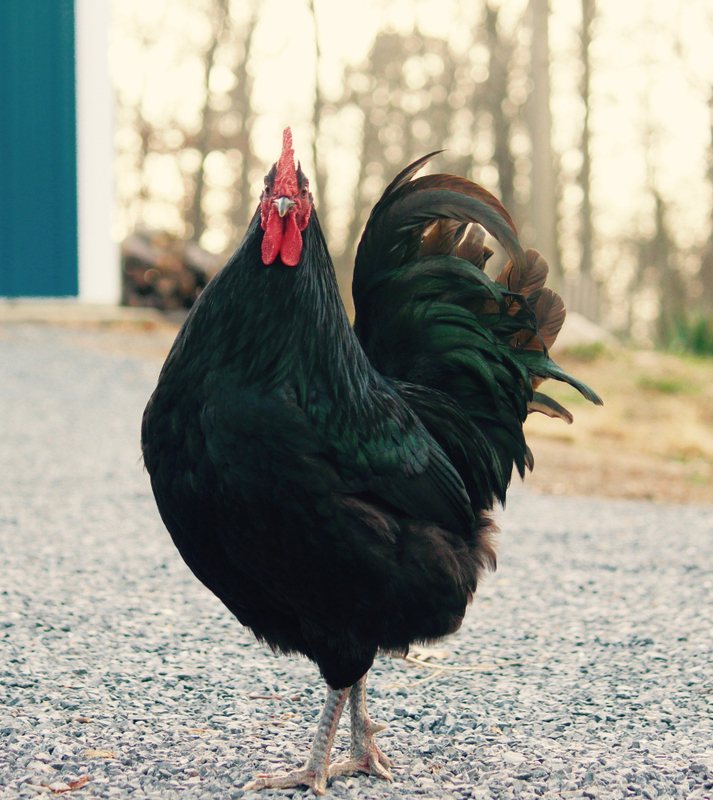 Black or White Langshan – The Black Langshans are also from the Asiatic Class of poultry and are a pure breed that originated in China many years ago. These large stunning birds are pure glossy black with bright red combs, dark eyes, and black shanks. These are very nice show birds, lay large brown eggs, and are gentle. The White Langshans are a large stately appearing chicken. Originating in China, these beautiful birds are pure white when mature with dark brown eyes and slatey blue shanks. These birds are very nice for showing.